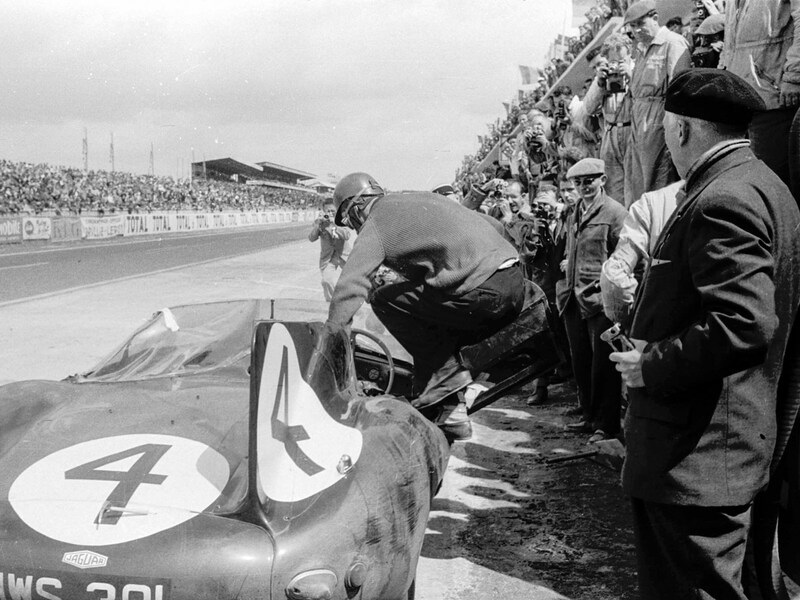 The Le Mans crash of 1955 was a wake up call for motor racing. The seriousness of that single event brought about changes that were to impact not only the 24 hours Le Mans race but were to flow on to the sport everywhere. This was a time when racing drivers were often losing their lives, and sometimes spectators did also. The technology of race track and race car safety had not been well developed but for the 1956 24 hours Le Mans the organizers were determined to ensure insofar as they could that there would be no repeat of 1955. The circuit had been altered, especially in the pit area where the 1955 accident had occurred with the enlarging of the radius of Dunlop Curve and the creation of a slowing down zone immediately before the entrance to the pits. Signaling for a driver to pit stop had been centralized (something that would almost certainly have prevented the 1955 disaster) and a ditch had been created between the track and the spectator grandstand. Ninian Sanderson jumps into XKD 501 during the 1956 Le Mans. (Picture courtesy LAT Photographic). Rules had also been introduced to begin to make the cars safer by limiting the engine capacity for the prototypes class to 2.5 liters, fuel tank capacity was limited to 130 liters, the minimum distance between re-fueling stops was set at 34 laps, and limits on the amount of time a driver could drive, no more than 72 consecutive laps and no higher total driving time than 14 hours per driver. These were initial best efforts at trying to ensure drivers had to drive to conserve fuel, and to try to minimize driver fatigue. As Jaguar were able to produce and sell more than the required fifty cars to be classified as production cars they were able to retain their 3.4 liter XK engine at its full capacity giving them an advantage. Classed as a Series Production Car the Jaguar D Type was permitted to exceed the 2.5 liter limit imposed on Prototype Cars. (Picture courtesy RM Sotheby’s). Thus it was that the Jaguar D Types entered in the 1956 Le Mans had the advantage of almost a liter more engine capacity, however, the fuel tank and refueling restrictions still meant that the cars had to make 26 liters per 100km so their advantage over the smaller capacity prototype cars was perhaps not as great as it might have been. For the 1956 Le Mans the Ecurie Ecosse team Jaguar D Type was fitted with a full width windscreen. (Picture courtesy RM Sotheby’s). Jaguar’s factory team entered three D Types, one of which was driven by Mike Hawthorne, the winner of the marred 1955 race and arguably an unwitting contributor to that disaster. Private Scottish team Ecurie Ecosse entered a Jaguar D Type painted in their dark blue team color with the Scottish flag of a blue background with a white St. Andrews cross. Below is a video of Mike Hawthorne doing a lap of the revised Le Mans circuit in practice prior to the 1956 race. The drivers lined up for the 1956 Le Mans reads like a list of motor racing’s royalty. It included Sir Stirling Moss, Maurice Trintignant, Colin Chapman (of Lotus), American legend Phil Hill, Lucien Bianchi, and the two adventurer drivers for the Ecurie Ecosse team: Edinburgh born Ron Flockart who would go on to make two attempts to break the flight record from Sydney, Australia to London, England, in a P51 Mustang – if you are going to break a record then doing it in the “Cadillac of the skies” means you will do it in style, and yachtsman Ninian Sanderson. Le Mans is a long and unpredictable race. In all there were thirteen accidents in the 1956 Le Mans including one fatality, and all of the Jaguar factory team cars were put out of the race leaving the Ecurie Ecosse D Type to battle it out with the Aston-Martins, one of which was driven by the legendary British driver Stirling Moss. 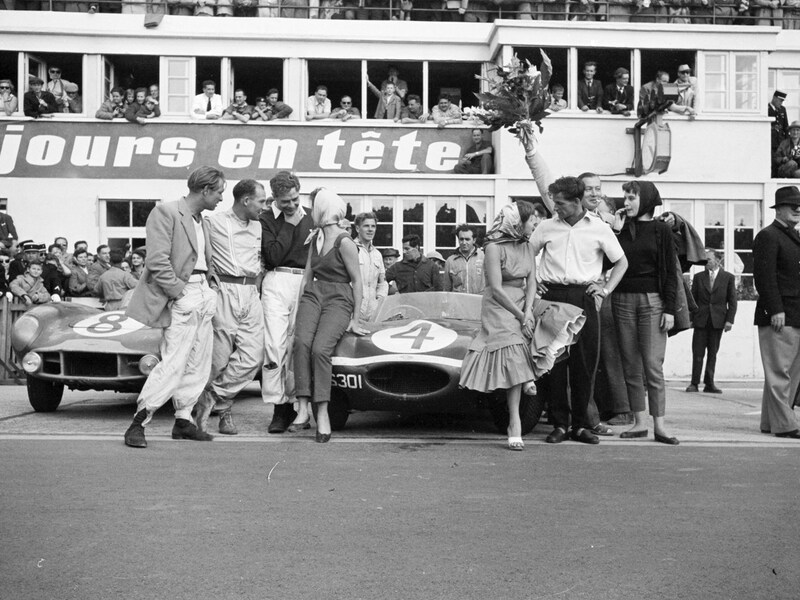 At the end of the 1956 Le Mans the Ecurie Ecosse team Jaguar D Type driven by Ninian Sanderson and Ron Flockhart was victorious and the Aston Martin DB3 S of Stirling Moss and Peter Collins came second. (Picture courtesy the Revs Institute for Automotive Research). 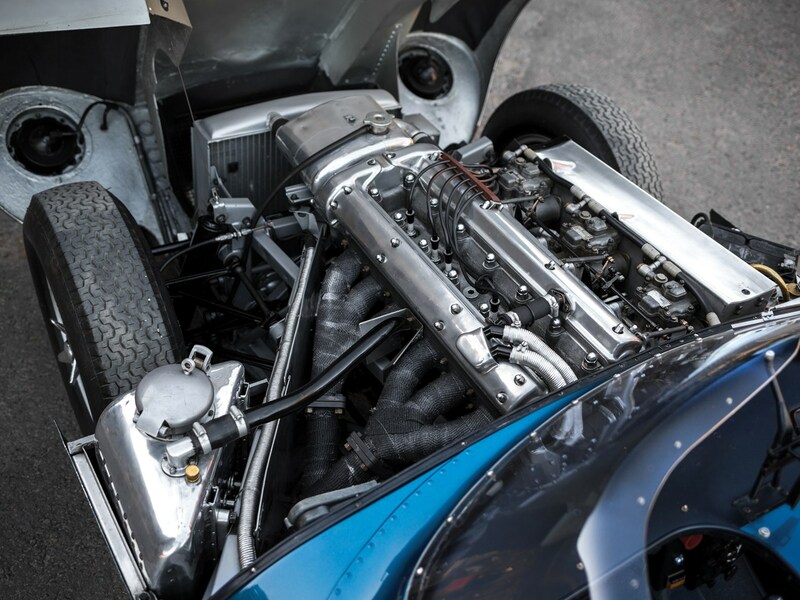 The Scots blue Ecurie Ecosse Jaguar D Type emerged the victor with the Aston-Martin of Stirling Moss and Peter Collins coming in second, and managing that without a functioning second gear. 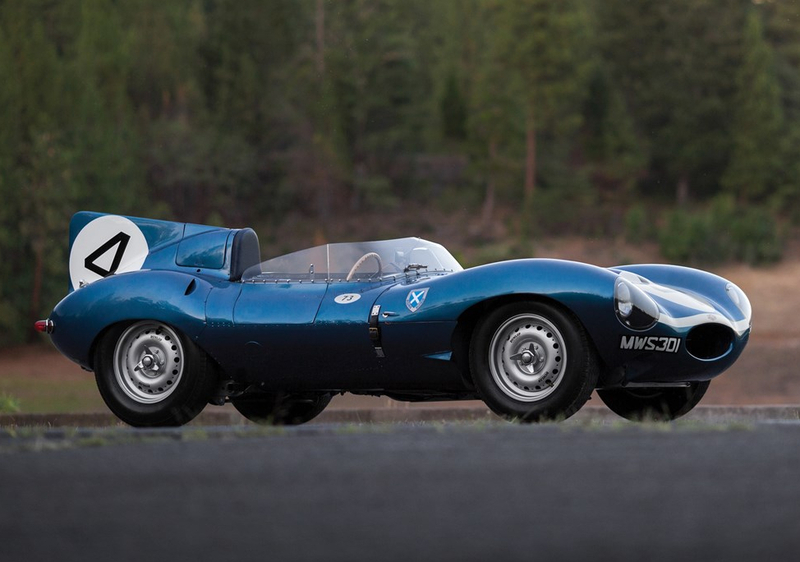 That blue Jaguar D Type has managed to survive unscathed right up to the present time and has been restored in its original state as when it won the 1956 Le Mans. 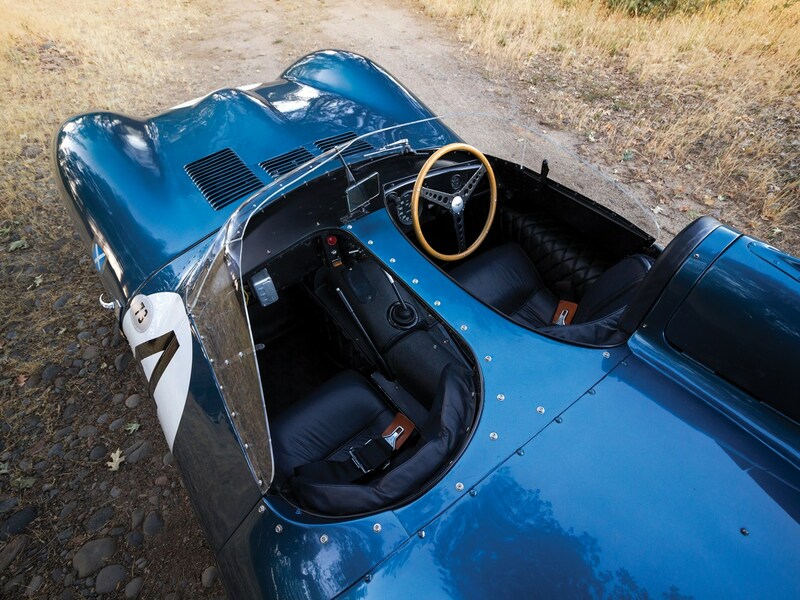 The 1956 Le Mans winning Jaguar D Type remains in original condition to this present day. (Picture courtesy RM Sotheby’s). This car is coming up for auction by RM Sotheby’s at their Monterey auction and will be offered on Friday 19th August 2016. 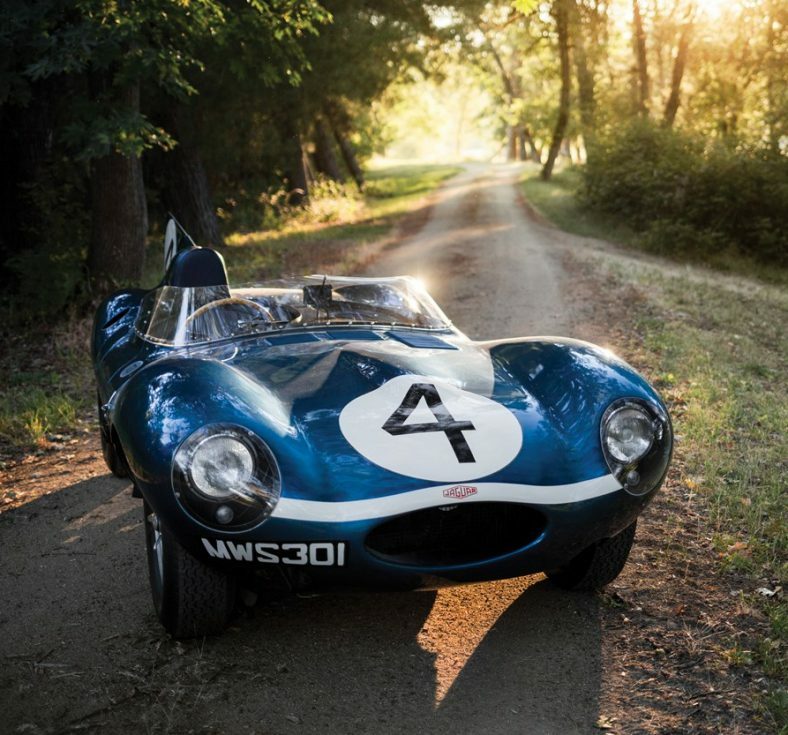 Expected sale price for this modest little blue Jaguar is around USD$20-$25 million. Owning a unique piece of autosport history comes at a significant price. Suffice to say this is a superb icon from the post war era in which motor racing was formed into what it has become in this twenty first century. These were the cars of the pioneers of modern motorsport. 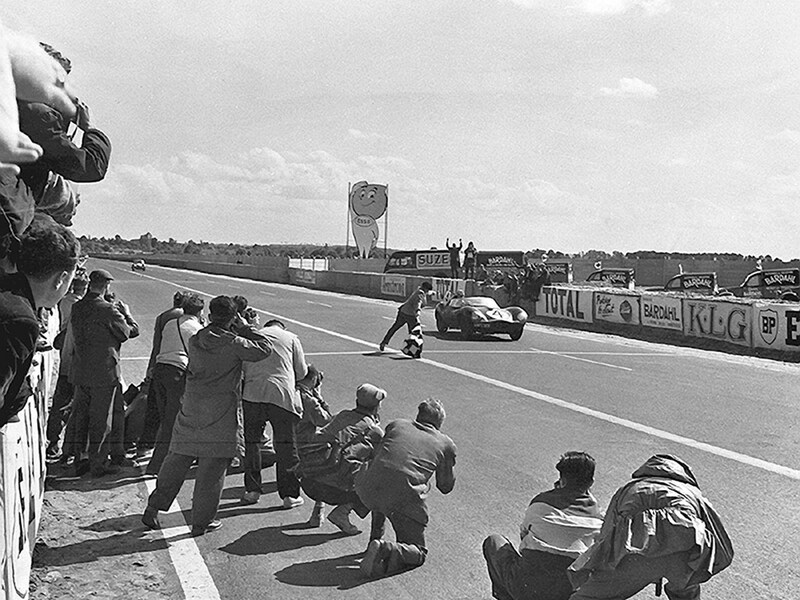 XKD 501 takes the checkered flag winning the 1956 Le Mans. (Picture courtesy the Klemantaski Collection).